The Apple Tree Workhops offered for free by us in partnership with the Brighton Permaculture Trust’s Peter May are in full swing now. 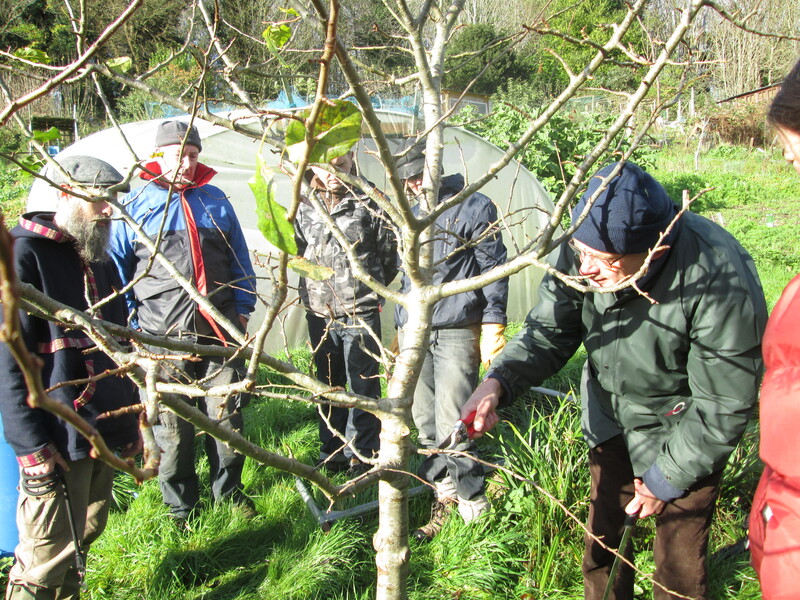 Peter came to Roedale Valley today to give his workshop on Apple tree pruning. 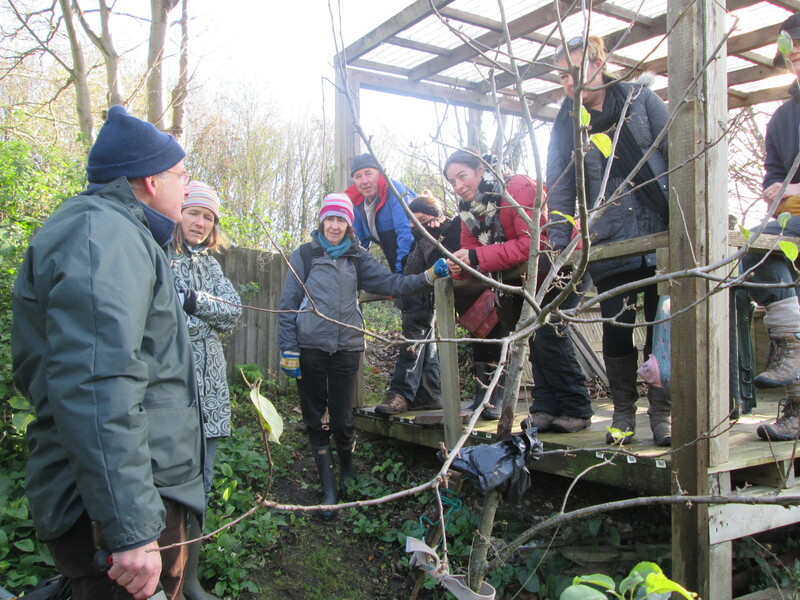 It was a cold day but the 12 of us who attended were treated with a very useful practical demonstration of caring for our apple trees. I think we all learnt something new, I certainly did. The workshop was really brilliant! There were 9 of us, and it was a very cold but sunny day. 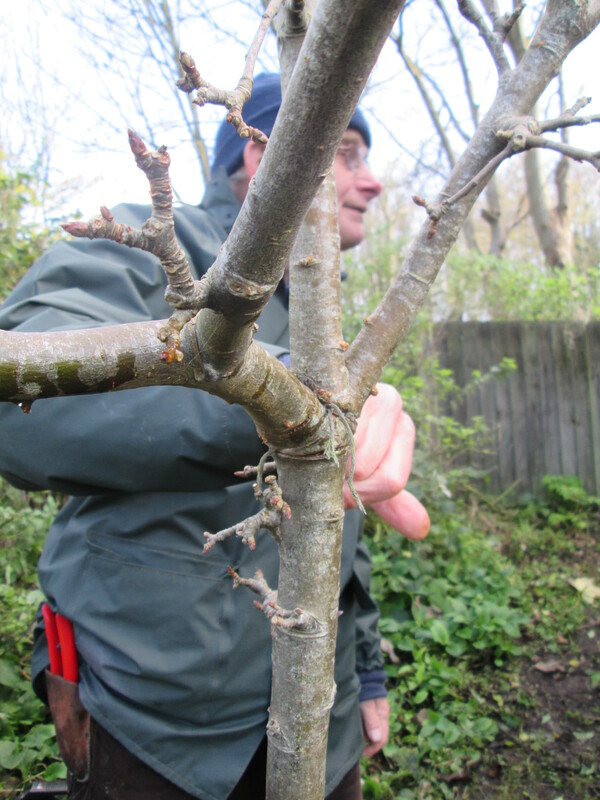 Peter was a relaxed and very engaging leader, who taught us loads with a very hands on approach – those of us who wanted to were able to practice using the pruning saw, learning the correct angle of the cut, after observing Peter carry it out himself . We also learned about dead, diseased and damaged wood, and learned how to assess the quality of our trees, one, for instance on our plot, was seen as not worth preserving. 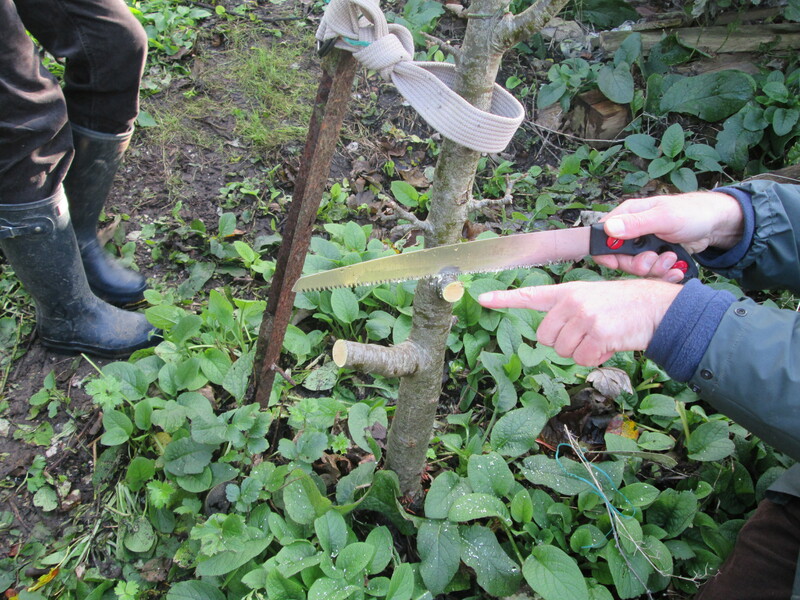 We learned how to stand back and assess the tree’s needs, and to keep an open centre. Peter really gave us loads of his time, and as well as taking some time over our biggest tree, explaining what he was doing and why, he taught us other techniques in relation to our other smaller tree, for instance weighing down a branch to change the shape, and how to stake it (we hadn’t even realised that it needed staking, even though it was very unsteady and in an exposed position!). We then went over to two other plot holders’ plots and looked at smaller and new trees, and Peter gave excellent advice and pruned these as well. 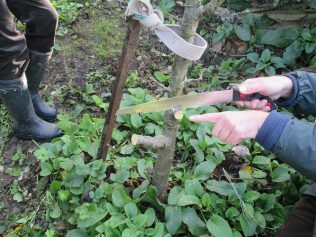 He began by introducing us to pruning tools and when to use them, and ended with showing us his sharpening stone, while I had a go and attempted to get the right angle! I certainly need more practice! He also did a short demonstration of grafting. All in all, there was something for everyone, whatever one’s prior knowledge of apple tree pruning. We had informal chats round a pile of pallets, combined with a hot cup of tea and biscuits. A great morning, and thank you so much for setting this up for us. Undeterred by the rain Peter May gave a superb talk and demo on how to look after our apple trees at PLOT 22 on the Weald last Thursday. So helpful to see how it’s done properly, with instruction on making good cuts which will heal quickly, pruning out shooting rootstock and sharpening our tools.